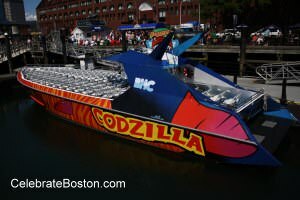 Codzilla is the only high-speed boat ride in Boston Harbor. In reality, the "high-speed" portion comes only after the vessel has left the harbor, as it is illegal for boats to go too fast while inside the no-wake zones near the city. Codzilla is a 70-foot boat that seats about one hundred people. The first 25-30 minutes of the ride is presented like a tour, with the guides describing landmarks that the boat passes by on the way out of the harbor. There is also a brief skit about pirates and the story of Codzilla, a giant cod. After leaving the harbor, the remaining 10-15 minutes of the ride is spent out in open seas, with the boat performing different maneuvers at a high rate of speed, which is the main attraction of the ride. The excursion takes about 45 minutes in total. In order to fully enjoy the ride, keep in mind some of these aspects. First and foremost, there is a huge probability that you will get wet. With 360 degree maneuvers, at high speed, it's a near certainty that you will get wet, so be prepared for this. Still, the ocean is ever-changing and you could get anything from a light spray to a full soaking. The "wettest" areas are usually the seats near the edges of the deck, and in the rear of the boat. There are waterproof bags available onboard, as well as inexpensive ponchos for sale. In general, pay attention to the dialogue and play along. As stated above, the tour part of the 45 minutes consumes a majority of the time, and it's more interesting to make the best out of this by listening and interacting with the guides, who do their best to make it an entertaining prelude to the high-speed jaunt. For your own personal safety, and the safety of others, the guides will warn the passengers: "DO NOT STAND UP" — especially in the high-speed portion of the tour. The boat travels about 45 miles per hour at times and makes sudden maneuvers, so enough said. Each ride is random based on the choppiness of the sea due to winds, or presence of other ship's wakes, which can make the high-speed portion so thrilling. Thus, passengers should carefully listen and follow the safety rules of the staff. Reviews of Codzilla have been mixed. One area of opportunity for the tour operator is to start on time as a lot of people have reported leaving a bit late. Also, possibly due to temporary technical problems, the onboard speaker system sometimes doesn't work. It's a big aspect of the ride as music is broadcasted, and the tour guides' microphones are hooked into the sound system. All in all, according to reviews, it's a great experience for children and people whose expectations aren't too lofty. It's a high-speed boat, and not a super thrilling double-loop roller coaster as a comparison. A pleasing aspect about Codzilla are the landmarks that the boat cruises by when leaving and entering the harbor. Great views of the waterfront and skyline are presented. The boat leaves Long Wharf and then passes by New England Aquarium, the beautiful Boston Harbor Hotel at Rowe's Wharf, and Fort Independence at Castle Island. Even if you're a native of Boston, this part of the ride will allow you to see the city from a different angle (literally) and you'll feel like a tourist in your own home town. Beautiful views of buildings, sailboats, and the coastline await you, just before the captain kicks it up to 45 miles per hour and has you holding onto your seat! Walking Directions: Exit the station, and walk east toward the ocean. The Boston Harbor Cruises ticket office is located diagonally across from the front entrance of the large brick Marriott Long Wharf Hotel.